Reisebericht Sprachkurs mit Praktikum Australien - Sydney - Charlotte T.
Sprachkurs mit Praktikum Australien - Sydney - Charlotte T.
I graduated from High School in the summer of 2015 and decided to take the chance and do a gap year. I wanted to try as many new things as possible. Meet new people, improve my English and experience a new country. I decided to come to Australia to celebrate Christmas at the beach and to catch some Aussie lifestyle vibes. However I did not only come to ’hang around,’ I wanted to gain some experience in the working world. 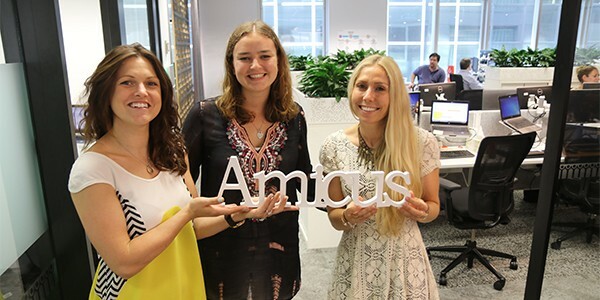 After one month at the language school ILSC in Sydney, the school introduced me to Amicus Interior, a company which does office fit-outs. I first saw their office at my job interview and after five seconds I thought I need to get that internship! And I had luck, they took me. The spirit at Amicus is truly amazing. They have a open-minded international team. To understand what makes Amicus so amazing and different from all companies I know so far it needs a bit of explanation. Their office is modern and stylish and you never use the same desk in a row. Every morning you have to choose a new place to sit which can’t be the same desk like yesterday. Depending on your mood you can work in the quiet area where you have to keep conversations to a minimum or at the open work space where the atmosphere is a bit more vivid. Everyone has a locker of his/her own for their personal belongings which reminded me a bit of the school days. What made me really feel part of the team was that I had own responsibilities like organizing the monthly cake celebrations where the company celebrates the people who had birthday during this month with cake and a personal gift or doing the weekly grocery order. You heard right! Amicus provides food and beverage for their employees. I am sure you are thinking, alright she just picked the good tasks leaving out the boring ones but I have to disappoint you, nothing is boring at Amicus and I could have easily chosen three other ones. Can it get even better? Yes it can! Amicus took us out for the Melbourne Cup and also organized a truly amazing Alice in Wonderland Christmas party in which I was involved with the organization as well a bit. The people I worked with became friends and I am sure I am going to keep in touch and I will always be proud that I got the chance of being part of the team. My time at Amicus flew by and I can’t thank Carl Duisberg Centren (my German tour operator) and ILSC enough for my time in Sydney and introducing me to this amazing company!